Ask someone with low back pain what they do to manage the pain, and you’ll usually get one of several responses: endure the pain or take over-the-counter pain medications. And in some cases, their doctor may have prescribed even stronger pain meds such as opioids, which have been in the news lately for all the wrong reasons. Of course, if they’ve been to a doctor of chiropractic before, they know what not enough people know: Chiropractic is a first-line treatment option for low back pain, while OTC and other pain medications provide only short-term relief, don’t address the root cause of the pain, and have side effects that range from mild to life threatening. Fortunately, research is proving the benefits of non-drug treatment options for LBP and emphasizing the relative lack of effectiveness / side effects of commonly used pain medications. For example, a recently updated guideline from the American College of Physicians recommends chiropractic and other nondrug options (acupuncture, massage, exercise, tai chi, heat therapy, etc.) 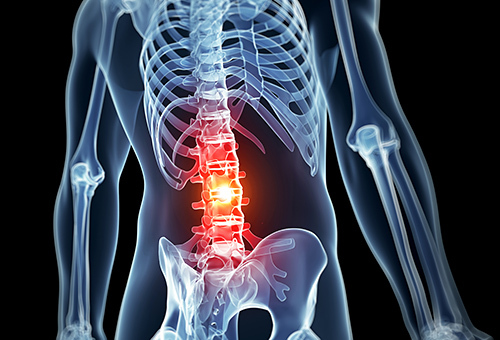 for acute (lasting less than four weeks), subacute (lasting four to 12 weeks) and chronic (lasting longer than 12 weeks) low back pain before turning to medication. Only if these options prove ineffective should doctors consider recommending medication, according to the guideline. What’s more, the study noted that 5-6 patients would need to take medication in order for just one to achieve a meaningful benefit. Let’s hope if you do take pain meds, you’re the one who does benefit, particularly considering “all NSAIDs have been associated with cardiovascular and gastrointestinal risks,” according to the study, whose researchers also found that NSAID use elevated the risk of adverse GI effects in the first two weeks of use. If you’re the majority who don’t benefit from the medication, why are you taking them in the first place when natural pain-relief options are preferred and recommended first? The bottom line: If you’re already seeing a chiropractor for your low back pain, great job! If you’re not, what are you waiting for? Physician guidelines and research are pointing you in the right direction.